Stewardship consists of systematic, responsible actions directly affecting ethnographic resources. It seeks to limit the loss of ethnographic resources and to maintain the characteristics of the resources that make them significant. Stewardship of resources results in the perpetuation and appreciation of the resource’s cultural value. Most threats to ethnographic cultural resources come from their surroundings. Fencing, pollution, and insensitive use can desecrate ethnographic resources. The two most important and effective protective measures are intangible. The first is a positive and caring attitude toward cultural resources. One of the purposes of this course is to heighten sensitivity of park employees to what constitute African American ethnographic resources to the end of improving stewardship of them. 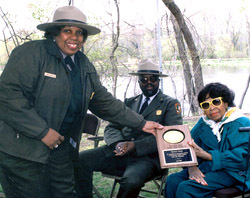 NPS ranger gives award to community member Martha E. Green, National Capital Parks East. The second protective measure is a spirit of cooperation that reaches out to form stewardship coalitions with local governments, professional organizations, state agencies, and nonprofit groups. This course is designed to enhance park personnel awareness of people and organizations in the public and private sector who may be potential partners in stewardship of African American ethnographic resources. In order to fulfill its legislated mission “to preserve unimpaired the natural and cultural resources and values of the national park system for the enjoyment, education, and inspiration of this and future generations,” the National Park Service adheres to ten guiding principles. The capability of an employee to carry out the mission of the Park Service in keeping with these principles can be directly related to their knowledge, understanding, awareness and appreciation of the cultural heritage and resources valued by diverse cultural groups in our society. Providing the best possible service to park visitors and partners. Collaborating with federal, state, tribal, and local governments, private organizations, and businesses to work toward common goals. Providing opportunities for citizens to participate in the decisions and actions of the National Park Service. Educating park visitors and the general public about their history and common heritage. Empowering a diverse workforce committed to excellence, integrity, and quality work. Providing developmental opportunities and training so employees have the “tools to do the job” safely and efficiently. Integrating social, economic, environmental, and ethical considerations into the decision-making process. Instilling a performance management philosophy that fosters creativity, focuses on results, and requires accountability at all levels. Incorporating research findings and new technologies to improve work practices, products, and services. Sharing technical information and expertise with public and private land managers. The information in this course about African American heritage and ethnographic resources helps the National Park Service to adhere to its legacy and the principles that support fulfillment of its mission. What is the National Park Service Thematic Framework? The National Park Service uses a thematic framework as a conceptual tool to help identify cultural resources that embodies America’s past. Over half of the units within the National Park Service (NPS) are cultural sites commemorating America’s multi-faceted history and heritage. Many of these sites are associated with African Americans. The NPS preserves these cultural resources—which include historic buildings, structures, landscapes and archaeological sites, as tangible evidence of the past—and strives to ensure that associated interpretive and educational programming conveys an accurate and comprehensive historical view of that past. This course, building upon the historical perspective, advances the cultural anthropological perspective, to interpretation and preservation of the African American past as an integral part of American heritage. Learn more about National Parks associated with African Americans. People, time and place are the central concepts in the Thematic Framework. In this course we recognize People as the primary agents of change. The course focuses on cultural patterns of Africans brought to the Americas and their descendants as we try to advance understanding and preservation of African American heritage in the park system. This course examines Africans and their descendants as change agents in the peopling of the North American continent and ultimately the building of the United States throughout historic time from 16th century Spanish explorations through the passage of the Voting Rights Act of 1965 and beyond. This course is designed to help National Park Service ethnographers, planners, interpreters, and other staff empower all Americans by helping to fill in the silences, unearth the buried, remove the disguises, authenticate the disqualified, and locate African American heritage centrally in the heritage of America that we preserve. Wherever possible, this will include the voices of African Americans describing and explaining the historic contexts that have significantly impacted their perspective on what constitutes their heritage, what that heritage is, and how it should be preserved.